Not a bad birthday. We road dirt this morning out of Ecuador, and street into Peru. And I did it with my youngest son, and thought of the other boys. We were concerned of paperwork getting into Peru as the permission paperwork I have doesn’t say peru. The old guy doing the paperwork is not having fun with his computer shutting down about three times, that by the time he got to maxxx’s bike I think he wasn’t even looking at the details. We were even helping him fill in the information on his screen. Getting old with bad eyesight and details were not his strong points today. Good for us though. we made it through and got on the road without any extra paperwork needed. Heat was scorching coming down in elevation from about 6k feet to 3k feet. We stayed riding as it is a way to stay cooler, we stop and we feel the heat. we did have to stop for fuel, and locals got their photos of the bikes. as we go to leave my bike won’t turn on. nothing, nada..our bikes have remote keys so we took out my key and tried to get it close to the antenna, still nothing, I know where the antenna is so we checked the connection to the bike and it’s good. we decided to check fuses, their located under the seat, so we unstrapped the soft luggage bags and took the seat off. I pulled one fuse and it’s good, pulled another and it’s good. I figured I would press the power for the bike to see if it’s a connection with the fuse . …bingo…power on. I think the second fuse was a main fuse and it acted like a reset. Not really sure, it worked so we put the seat back on and headed down the road. As all this was happening more people stopped by and wanted photos, so they got shots with us working on the bike. They sure can pack their vehicles with people. one Toyota four door truck had 9 people in the truck, some kids, and a full bed of stuff all the way up to the roof. And then an older man and younger girl sitting on the very back with feet on the bumper, like they must have had to hang on to not fall off. Not very uncommon south of the border, if theirs a vehicle going somewhere anybody wanting a ride gets in or on the vehicle. So we end up in Jaen Peru for the night. 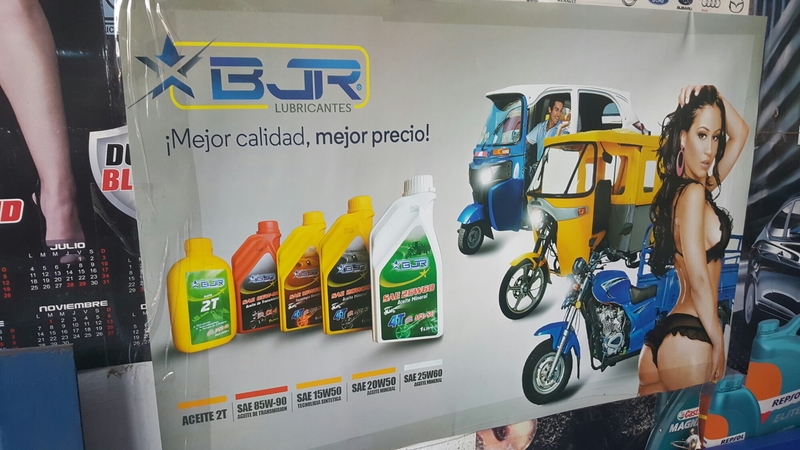 I find some oil for an oil change. 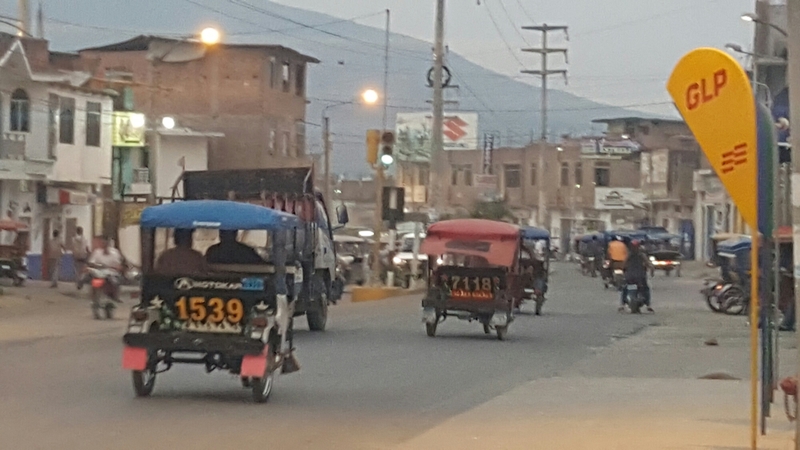 this must be the tuk tuk capital of Peru, their everywhere and intersections are a weaving of vehicles, everyone avoiding all objects and keeping their destination a priority. I need a new rear tire, so we will look tomorrow in town, all motos are small here, so good luck with that. I need to look for some spare fuses too. I’ll think about what may have caused the glitch on the electronics today too. First thought was the remote key battery, but I don’t see where it’s replaceable, and doesn’t make sense seeing as the fuse reset was the fix. hmmm…. Also a thanks to those that wished me a happy birthday. Mom and Dad, thanks for having me and being my guide through life that I would do a trip like this. Maybe it started with all the road trips we did as kids, or time at Lake Limerick. We found this amusing….a pin up girl for tuk tuks. how awesome is that. I guess they have some cred out here. On the road again heading south Jaen Peru. heading up into the mountains on a dirt road toward Cuervo. 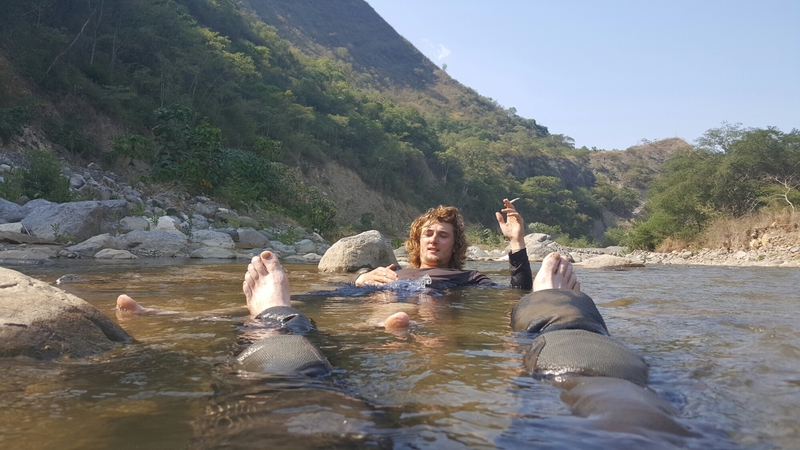 Into about ten miles of a 45 mile dirt road we stopped for a dip in the river as the heat was well into the nineties. As we are now cooled down and ready to keep riding…..my bike won’t start.No power to the bike again. we go through the same routine as yesterday and pull the fuse and put it back in. Still nothing.We check all the fuses and reinsert them. still nothing, we’re getting a bit concerned about this time. We are thinking maybe some sensor or the main computer got hot and fried. I look at Maxxx and we talk, we aren’t leaving the bike, we stay here and figure out what we can and stay the night if we have to. 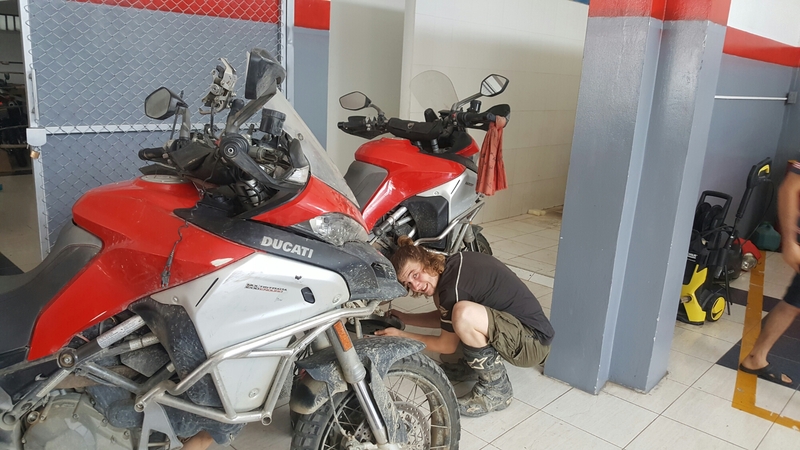 If we don’t get the bike going last resort is to have the bike hauled to lima, which is more miles then I want to think of. 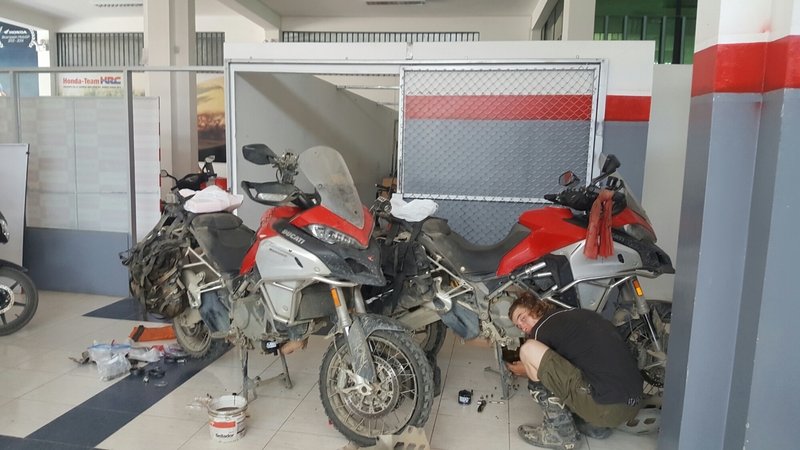 For these bikes you have to hook it up to a computer to find out what’s wrong with it and only dealers have them. We try to eliminate some of the relays by swapping the ones from maxxx’s bike into mine. we swap the main computer, it’s good, relays seem to be good as well. we unplug and replug some connectors. Nothings helping it turn on, but we are eliminating the possible sources of our problem. I unplug the main power cable and push a couple wires around.The bike turns on, we hope it stays on.It starts with no issues so it’s somehow in getting the main power on. I don’t know if it the hands free, remote key that’s causing our issue, but we’re happy to be on the road again. I am sure this will haunt us again, but for now it’s moving and we’re eliminating some of the possible causes. It’s expected to have issues with the bikes when you run them this hard in these conditions, you just don’t want it to happen, when it happens. So for now thanksgiving we will wake up in a town, and get on the road and deal with tomorrow when it comes. no thanksgiving down here, but Maxxx and I will mark it somehow, even if it’s just thinking of family back home, Maxxx and I are together, it would be more challenging alone, so we have each other to know we’re safe and with our mini family.